Eluded by your quick wit? You’re not alone. The ability to think quickly is a highly valued skill in the workplace. People who respond to questions off the cuff, who make coherent contributions when called upon (without warning) or who always seem to know the right thing to say in the right moment to say it, are admired by many of us. Especially those of us who need more time to gather our thoughts. Many of my clients complain that it’s hard to create the right impression with others when they are forced to think quickly. Not being able to think quickly, they argue, is creating a false impression that they are not able to think at all! Which is not the case. The modern workplace, and meetings in particular, favour those that speak up and share their thinking. Those that require a moment’s reflection to gather their thoughts and clarify their response are unduly punished. There is a way to avoid the perception that your silence means you can’t contribute, and it doesn't require a personality transplant. Rather than working against your natural preference by trying to think quickly, force an answer or speak for the sake of speaking, have a standard response ready for when you’re not ready to give a response. Having this ‘go to’ response pre-prepared allows you to respond quickly and confidently and train your colleagues and clients on how to get the best out of you. It also paves the way for other reflectors who are just as uncomfortable in those moments as you were. Employ this strategy and half the population will thank you. Anneli is an author, speaker and communication expert (a.k.a professional People Whisperer), who helps her clients improve their influence, engagement and impact. She’s obsessed with decoding people dynamics for improved performance and specialises in interpersonal intelligence - the ability to understand and navigate the people dynamics in a given situation. 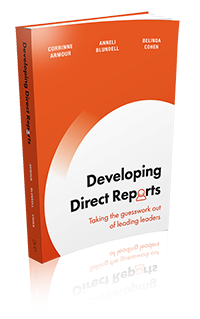 Anneli is the co-author of Developing Direct Reports: Taking the guesswork out of leading leaders. Newer PostWhen the problem is the solution – taking the counterintuitive path.